A little less than a month ago, the Blue Cross Blue Shield Association--the trade group representing state-based Blue Cross and Blue Shield plans--released a misleading study suggesting that health care reform would mean higher premiums for small businesses and individuals buying coverage on their own. :..for those facing purchase in the non-group market, the SFC bill will deliver savings ranging from several hundred dollars for the youngest consumers to over $8500 for families. This is in addition to all the other benefits that this legislation will deliver to those consumers--in particular the guarantee, unavailable in most states, that prices would not be raised or the policy revoked if they became ill. In part because the Association's paper came on the heels of another, even more egregious insurance industry study, most of the media ignored it. But it looks like at least Blue Cross affiliate has found a new way to put the material to use: By distributing the information to small businesses that buy its coverage. TNR has obtained a pair of letters that Blue Cross Blue Shield of Illinois and its parent company have sent to those small businesses in the last two days. The first letter--dated November 4--predicts, among other things, that small businesses and individuals buying on their own could see premiums rise by "as much as 119 percent." 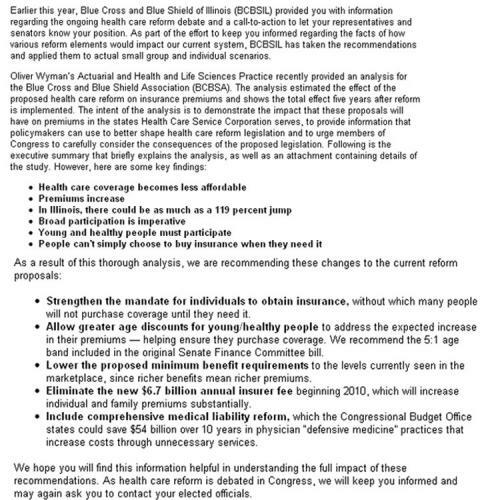 The second letter, dated November 5, warns that reform will "dramatically increase premiums for individuals, families and employers." The spokesperson, Mary Ann Schultz, said that Blue Cross Illinois stands by the findings of the Oliver Wyman study. To be fair, a major worry for the Blues--and the insurance industry as a whole--is that the requirement for people to get insurance isn't strong enough. This is a totally legitimate concern. If the requirement is too weak, young and healthy people will avoid taking insurance, creating a "death spiral" in which the pool of people hanging on to insurance are increasingly unhealthy, thus driving up premiums. Of course, insurers like a strong mandate in part because it guarantees them more customers. And the House bill actually has a strong mandate, so the complaint really doesn't apply there. Subject: URGENT! GRASSROOTS ACTION ALERT! PLEASE CONTACT YOUR MEMBERS OF CONGRESS TODAY! As a business owner who provides health insurance coverage to your employees, you know firsthand how critical it is for health insurance premiums to remain affordable for you and your employees. Blue Cross and Blue Shield of Illinois, a division of Health Care Service Corporation (HCSC) is working with stakeholders like you to ensure reforms work by building on today’s employer-based system to extend coverage to everyone, rein in costs and improve the quality of care. We are now at a critical point in the legislative process and your help is needed to voice concern over the pending legislation in the House of Representatives. Your help is needed in the next 24 hours to voice concern over the Affordable Health Care for America Act. Tell your Representative to vote “NO” on H.R. 3962. Health care reform legislation in Congress will unintentionally increase premiums to levels that are unaffordable for individuals, families and small businesses. Affordability is the most critical factor in extending health care coverage to everyone. There is no question that changes need to be made to our health care system and Blue Cross and Blue Shield of Illinois supports a requirement that health insurance companies offer coverage to all applicants, regardless of pre-existing conditions. However, this only will work if every American is required to carry health insurance, minimum benefit levels are sensible, young and healthy individuals are encouraged to purchase coverage, and the personal responsibility requirement is enforceable. A government-run health plan in any form – A government plan in any form is unnecessary, would immediately or eventually underpay providers causing major access issues, would increase cost shifting to private insurance and cause millions of people to lose their existing private coverage. A weak individual mandate, high minimum benefit designs and narrow age rating bands – These proposals will combine to dramatically increase premiums for individuals, families and employers. Congress is making decisions that will affect your business now. I urge you to contact your Members of Congress today on this critically important issue. For more information on Blue Cross and Blue Shield of Illinois’ grassroots efforts or if you have any questions about this action alert, please send an e-mail to HCSCGovernmentRelations@hcsc.net. To stay informed about health care reform and other public policy issues that affect our company, please visit www.healthcareatacrossroads.org. As always, I thank you for your relationship with us and the value you bring to our customers.